Holoholo with Hawaiian Music Live as we travel to the Maui for the 26th Annual Celebration of the Arts. 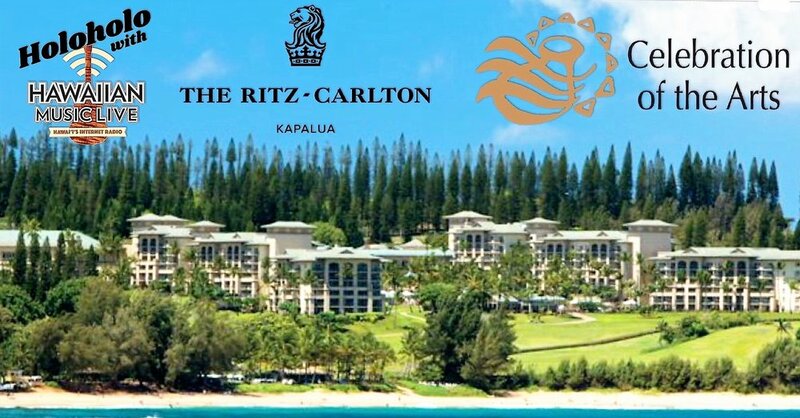 The Ritz-Carlton, Kapalua will convene Hawaii’s most reputable artisans, educators, cultural practitioners, speakers and entertainers, March 30 - 31, during the 26th Annual Celebration of the Arts. For more information on 26th Annual Celebration of the Arts, please visit www.kapaluacelebrationofthearts.com. For more information on The Ritz-Carlton, Kapalua, please visit www.ritzcarlton.com/kapalua. Listen as we streamcast live from The Ritz-Carlton, Kapalua and the 26th Annual Celebration of the Arts: Celebration After-Hours. 9 PM - 10:15 PM (HST) - Enjoy the voice of Grammy Award winner Kalani Pe`a and his band. From Hawaiian music to soul and soultry blues, he takes command of the stage and will not disappoint his audience. 9 PM - 12 AM (HST) - Maui’s own Ikaika Blackburn and “Na Hoa” lay it all out with their CD release party. Now becoming a Celebration of the Arts tradition, Saturday night is reserved for the expose of new songs and dances. You never know who is going to make an impromptu appearance and grace the stage! Josh Kahula and his band ‘Nuff Sedd also return to the center stage to rock the night away. In 2017, no one in the audience wanted it to end. Do not miss this party of all parties!